Announcement ALL ITEMS ARE READY TO SHIP. No waiting. (NEW) You can now checkout as a guest. No signing up. Lot of new items. (NEW) If you are buying and shipping a gift to someone, I will be glad to put a note card in the box and tell them who it is from. Just let me know. I only put ONE Complimentary Care Kit with almost all orders, additional one can be purchased in the Care Products section. About FREE SHIPPING I do not offer it, because I would have to raise my prices to justify the cost. If I was to raise my prices by seven or eight dollars on each item and make it free shipping, like my competitors, you would lose money. Multiple items in an order is where you would save, because I ship by weight. When you see a Out of Stock item, just wait a couple of days for me to make some more or send me a message that your waiting. Get to know me a little bit better. Copy and paste the link above. If you like what you see, go to my (FACEBOOK PAGE) and Like it.Link is at the bottom of this page. I am new to Etsy.com, but not new to spoon making. I have built an inventory that is ready to ship. I use mostly Cherry and Walnut, because customers love the colors. All my spoons and salad bowls comes with a Care Kit for free. I put the spoon in a plastic sleeve and seal the ends, so if the post office has a bad day your spoon won't be damaged and the packing material won't soak up the oil on the spoon. My spoons are nice to look at as well as to use. Almost all the spoons and spatulas have a bumpy old look and a new feel to the handles. This is a technique my dad taught me years ago. I started doing more handles that are smooth because customers on Etsy might not know what I'm describing. You just have to feel them. Some of my spoons bowls are round, which I turn on the wood lathe. The others I chisel and scrape the bowls. Wet wood I boil in water for strength, let dry then, I sand smooth, then wash, dry and re-sand, then coat with a beeswax, mineral oil mix. Let dry, then buff. I noticed that a lot of big sellers of wooden spoons on Etsy make their spoons on an CNC machine and telling the customer that it's handmade. People buy what they want, but the thing that gets to me is the customer thinks they are great craftsmen and all they are doing is pushing a button on a computer. I saw an old spoon in my wife’s spoon drawer the other day, so I asked where she got it. She told me my mother gave it to her before she pasted. This spoon was a spoon I made when I was a kid. I burnt the bowl out, the carved it. Didn’t know mom even kept it. Oh well life goes on. My pepper mills are made with exotic wood and most of the designs are from some of my table and chair leg, I used to turn. I make different size salad bowl and will post as I get them made. 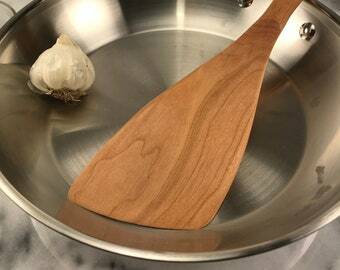 Cutting boards are one of kind. No two alike. Most every weekend I’m at some arts and crafts festival, hope to cut back some with Etsy. Thanks for looking and if you ever have a question please contact me. ALL ITEMS ARE READY TO SHIP. No waiting. (NEW) You can now checkout as a guest. No signing up. Lot of new items. (NEW) If you are buying and shipping a gift to someone, I will be glad to put a note card in the box and tell them who it is from. Just let me know. I only put ONE Complimentary Care Kit with almost all orders, additional one can be purchased in the Care Products section. About FREE SHIPPING I do not offer it, because I would have to raise my prices to justify the cost. If I was to raise my prices by seven or eight dollars on each item and make it free shipping, like my competitors, you would lose money. Multiple items in an order is where you would save, because I ship by weight. When you see a Out of Stock item, just wait a couple of days for me to make some more or send me a message that your waiting. Stew Pot / Tea Spoon 18"
Short Roux Paddle / 11"
Steve is a master of his art. The wood he uses is gorgeous and his craftsmanship is flawless. I appreciate his care instructions and that he includes mineral oil and wax to keep pieces looking beautiful. Whether you're looking for a special gift or treating yourself, you won't be disappointed! Mississippi Spoons/Windham’s Woodworks is owned by me, Steve Windham and I am located in Brandon, Mississippi. I work with all kinds of wood, both domestic and exotic. I build a wide-range of products from large pieces of furniture to small boxes, bowls, and cooking spoons. I am a member of the American Association of Wood turners, Magnolia Wood turners and a Fellow and Standards Committee member of the Craftsmen's Guild of Mississippi. I have also won several awards for my woodturning art. With pieces in three museums in Mississippi, articles in Eat. Drink. Mississippi, American Style, Magnolia State of Mind magazines and the cover of Ridgeland Life magazine. One piece bought for permanent collection of The Growth Alliance and two pieces were also taken to Japan in July of 2007 and given as gifts to CEO of Toyota and Nissan. Steve and i have been married for 36 years now, and we purchased our land 1 year after. We built the house and wood shop. I usually help Steve with the finishing and at art festivals. I love meeting and talking to people. We don't do that much, but we like to watch Steve work.